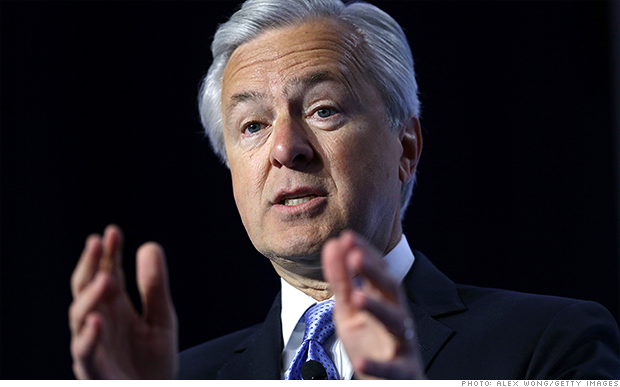 John Stumpf of Wells Fargo was the highest paid bank CEO in 2013. In 2013, it paid to be the boss of a bank. The CEO of Wells Fargo, John Stumpf, received $19.3 million last year. That includes base pay, bonus, stock options and long-term incentive awards if Stumpf hits his targets. Stumpf won the highest paid bank CEO prize, according to a study of regulatory filings by SNL Financial, but you don't have to be the head of a mega-size financial group to rake it in. The men who run regional banks, including some you may not recognize, are compensated handsomely. The head of a bank based in Akron, Ohio paid its CEO $16.4 million last year. That was enough to make FirstMerit Corp. (FMER) CEO Pat Greig the fourth highest paid bank chief in America. FirstMerit is only the nation's 29th largest bank. PacWest Bancorp's (PACW) Matthew Wagner received a windfall of $11.9 million, making him the eight highest paid bank CEO overall. However, much of Wagner's compensation was tied to stock awards that vested when PacWest acquired CapitalSource. Overall, pay continues to rise for bank CEOs, according to SNL. The median CEO pay among the 617 bank in the study was $565,169. That's up 48% from 2012, when the median compensation was $381,322. Jamie Dimon, who was the highest paid bank CEO in 2012, fell to number nine after JPMorgan (JPM) cut his bonus in half, reducing his total pay package to a mere $11.8 million. The pay cut came after JPMorgan reported a $6.2 billion loss from the so-called London Whale trade -- the massive bet on credit derivatives made by one of the bank's London units that went terribly wrong.